Your circuit breaker box, fuse box, or service panel, is the electrical heart of your home. Its purpose is to regulate how much power comes into your home, and route it safely throughout your breakers and wiring to light fixtures and electrical sockets. It’s very important that the size of the breaker box is commensurate with the amount of electricity and types of appliances that are enjoyed by the home’s occupants. When a family moves into an older home, before they start painting or paneling or adding those elegant little string lights to the barbeque pit patio, it’s important to make absolutely sure that the heart (circuit breaker box) can handle the added strain. If not, just like a human heart, the electrical system will fail, and usually right at the crucial moment. Let’s go back to the box for a moment. The main breaker feeds power to each of the circuits, which in turn supply power to their designated area. If the main breaker isn’t in the circuit breaker box, it may be near the electrical meter. Each of the circuits has a specific type of breaker. A single pole breaker, which is the regular kind, is made for a 120-volt load. A double is made to handle 240 volts. Double poles are used for the big stuff like hot water heaters, clothes dryers, hot tubs, things which create a huge draw. The sum total of power a breaker box handles is a number of amps. The number and size of the circuit breakers determine how much power is allowed into the house. 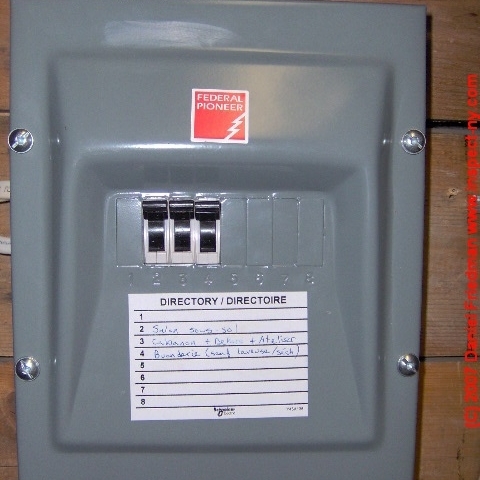 he Main breaker switch will be located in or around the box or meter. A typical circuit breaker only operates at about 80% capacity. Think about it; if your car can travel at 120 miles per hour, are you ever, for any reason going to drive it over 95 miles per hour? It is an unwise practice to overload the circuits in your breaker box, especially on a regular basis. Fortunately, if there is too great a load placed on the circuit, the breaker will trip and the power will go out on that circuit before there is a fire or electrical shock. It used to be that the average home had a 60 amp breaker box. Then the internet came along, large screen tv’s, cell phones, Play Stations and Smart homes. Now, even 100 amp breaker boxes are the bare minimum. But, when a homeowner needs a new breaker box, the question arises as to not only how much electrical power the family needs (expressed as watts /volts=amps-20%), but how much the occupants will need every year for the next 20 or so years. Because a misguided too-small size can create electrical proms, both in terms of blown fuses and continuous overload.